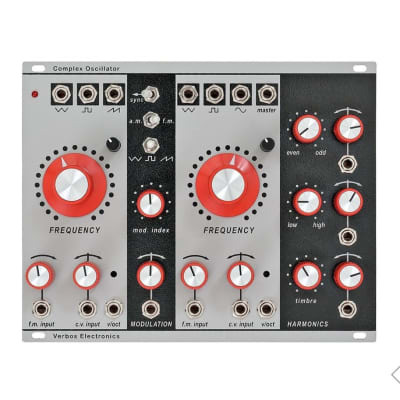 In the West Coast philosophy of synthesis, one oscillator modulating another is a classic way of creating rich timbres. 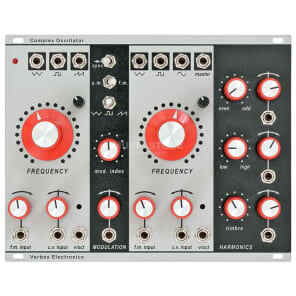 Voltage control of the modulation and of the waveshape is essential for evolving the sounds from whatever CV sources. 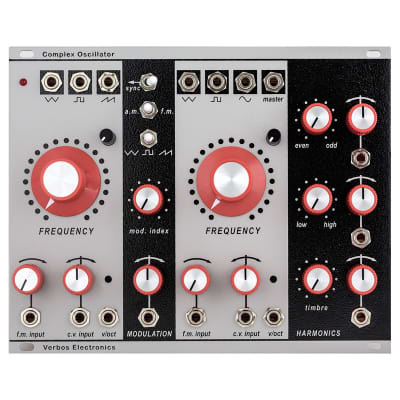 The Verbos Electronics Complex Oscillator is configured as a master oscillator with an voltage controlled waveshaper and a modulation oscillator that can be used for FM or AM. The waveshape of the modulation can be set to triangle, square or saw, each with a dedicated output. Modulation amount can be voltage controlled with a reversing attenuator on the CV input. 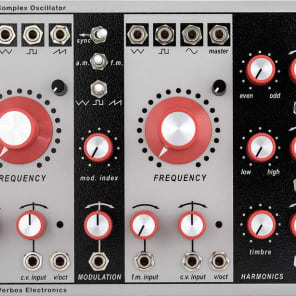 The master oscillator has dedicated outputs for triangle, square and sine waves. The master output can blend from sine to square to saw to folded sine all from voltage control with reversing attenuators on all of the CV inputs. The oscillators are analog triangle cores with discrete transistor exponential converters. 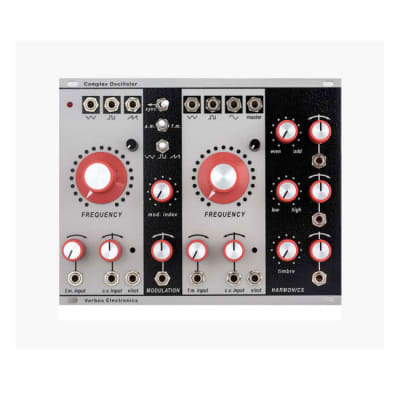 Each has inputs for linear and exponential FM. Both have 1 volt/octave trimmed CV inputs as well.